I pray a miracle continues to work on Diane’s behalf, and I’m also selfishly grateful for the reminder she has given me. Our lives are fleeting, and the best day to fight for the right to live a full life is today. For those of us lucky enough to have our health, this means doing something amazing today. And by “amazing,” I mean taking small, positive steps forward on a purposeful path. Because everything you want to do takes daily practice. Whether it means to learn to dance by practicing dancing or to learn to live by practicing living, the principles are the same. In each, it’s the performance of a dedicated precise set of acts, mental and physical, from which comes the sense of achievement, clarity of one’s meaning, and a satisfaction of the inner spirit. One becomes, in some way, an athlete of Life itself. And practice means to perform, over and over again in the face of all obstacles, some act of vision, faith, or desire. It’s the only means of lifelong fulfillment. I am being honest with myself. – Be honest about what’s right, as well as what needs to be changed. Be honest about what you want to achieve and who you want to become. Be honest with every aspect of your life, always. Because you are the one person you can forever count on. Own your choices, and be willing to take the necessary steps to improve upon them. Either you take accountability for your life or someone else will. And when they do, you will become an instrument of their ideas and dreams instead of a pioneer of your own. I am making a difference. – Act as if what you do makes a difference. It does. Is it true that we all live to serve? That by helping others we fulfill our own destiny? The answer is a simple “yes.” When you make a positive impact in someone else’s life, you also make a positive impact in your own life. Do something that’s greater than you – something that helps someone else to be happy or to suffer less. You are only one, but you are one. You cannot do everything, but you can do something. I have been brave enough to be vulnerable. – So many of us feel alone, even when we’re surrounded by others we call friends and family. Inside, regardless of present company, we feel misunderstood and scared. We worry that telling people about our fears will make them think less of us. We wonder if anyone else feels the same way we do. We convince ourselves that we’re weird, that no one else hears the voices in their head, that we’re the only one who needs a hug. Well wake up! YOU aren’t alone. Be brave enough to open up to those you love, and you’ll see that I’m right. Tear down any emotional brick walls you have built around yourself. Owning your story can be hard, but not nearly as difficult as spending your life running from it. Embracing your vulnerability is risky but not nearly as dangerous as giving up on love and friendship and personal growth – the life experiences that require you to be the most vulnerable. I persevered through tough times. – Sometimes you have to die a little on the inside in order to rise from your own ashes and believe in yourself and love yourself again. Call it growth. Call it finding yourself. Call it whatever you want. The key is to live moment to moment when times are tough, and push forward, until moments become minutes… minutes become hours… hours become days… days become weeks… weeks turn to months… and time again has meaning… and life becomes a reason to smile. The process is almost like learning to walk or speak for the very first time. It isn’t easy, but in the process we grow and we find ourselves, stronger, wiser, and possessing talents we didn’t know we had. When we refuse to give up on ourselves, the toughest of times can lead us to the best. I have no regrets. – This one is simply an amalgamation of the previous eight, and then some… Follow your heart. Be true to yourself. Do what makes you happy. Be with who makes you smile. Laugh as much as you breathe. Love as long as you live. Say what you need to say. Find the courage to feel different, yet beautiful. Find it in your heart to make others feel good too. Know that you don’t need many people in your life, just a few great ones, so don’t lower yourself and your standards for the wrong reasons. Be strong when things get tough. Remember that the universe is always doing what’s right. Recognize when you’re wrong and learn from it. Always look back and see how much you’ve grown, and be proud of yourself. Appreciate all the things you have. Celebrate your small victories. Forgive. And let go of the things you can’t control. Many moons from now, when you’re on your deathbed, what’s one thing you absolutely want to be able to say about yourself and your life? These points echo perfectly how I’m living my life now. Just over a month ago my 45-year-old hubby was told he had incurable cancer. He has evolved from a suited workaholic into a guy who now enjoys wearing tactile bright colored clothes, daily gym visits & is a green smoothie lover. Yesterday he was checking out meditation retreats. Instead of endless sport & business news journalism he is now reading soul enriching books & blogs like yours. We no longer escape into drone tv, we choose well written thought provoking dramas & documentaries. We make every moment count. Cancer & the threat of early death has made us finally live. Thank you for this timely post. Lots of loving thoughts from Denmark. You’re words are so… strong, true and up-lifting. Reading your blog is like getting a big warm hug, but still a gentle shove back on track. Thank you for reminding me too keep following my path to becoming the person I wanna be .. who I already am. Thanks for this post. It’s precisely the type of wisdom that turned me on to your blog, book and email newsletters over the past year. Honestly, as someone well verse in personal development and wellness, I can say each of these nine things, and I can say that the story continues to evolve. There will be opportunities as long as I live to have new opportunities to experience these 12 things anew. Getting free of “somewhere over the rainbow” thinking that I’ll finally “arrive” or that “I am this or that” has been the greatest of all insights so far. As Dorothy essentially said, in the movie, “it was here (within) all along”. The best version of “me” is not an endpoint, but an eternal journey of discovery and learning to “in joy” the journey and stay present is what continuously sets me free, – spirit, mind, heart and body. Been a long time follower of this blog. Was surprised when a friend in school shared one of your inspiring pieces with me. Thought I was the only one following over here. We love you in Nigeria. This is a great article! I’ve really enjoyed it. And I’m all with you that helping others, helps you too. I woke up today and just before reading this, thought: imagine. believe. act. create. It is about dreaming of what we want, believing in ourselves, taking steps toward making it happen and watching how it unfolds before us. We can all do it. And it starts with imagining. Beautiful. May your kind spirit shine on. I have been very impressed with the emails and blogs posts I’ve been receiving from you and I am particularly happy to say that many of these particular items I am using daily. Last spring I had a bad accident while logging and had both legs operated on at the same time. I never lost my sense of humor, I never said “why me” I owned the problem and worked everyday to be able to walk again. It has been a hardship that changed my life FOR THE BETTER. I am exercising regularly, eating healthy (including green smoothies), look at life as given a new start and am in the process of finding my last great love. I am 66 years young and life is wonderful and exciting! I stopped caring what people thought and had a ball doing my thing! It made all the difference. Things in my life have been ridiculously crazy lately – various illnesses, stresses at work. This has led to many sleepless nights. To help recenter myself and slow down, I’ve started repeating the following over and over again to myself while breathing deep into my abdomen: “I am alive. I am happy. I am strong.” Some days I feel like I’m only 1 out of 3 or 2 out of 3. But the more I say it, the more I believe it. Thank you for always providing me with such great and valuable insight … I have been reading your posts for years and share them frequently. This post particularly hit home for me today with regards to vulnerability. I am a health and wellness coach, I teach programs about nutrition and how to work great choices into our daily lives. My goal is to help women get off the diet yo-yo circle and live our best life. Last year my Mom passed away from a 10 year struggle with Alzheimer’s. She was my best Friend and Hero. I miss her every moment of every day. In the last weeks, she was in hospice and could no longer eat food, so we unfortunately had to make the choice of letting Her go. It took 3 weeks for her to pass away.. And seeing this as well as losing her to this horrible disease just about broke me. I found myself again in a terrible state of grief and pain after her passing. Totally understandable I know. However, my methods of dealing with that grief created a trigger to emotional eating and drinking … And terrible guilt “because as a health and Nutrition coach, I should know better.” Or at least this is what I told myself… Which only compounded the problem. I have gained about 25 lb from these unhealthy escapes and am now back on the path to gaining my health back. I want to share my story with others …. And this will take courage and vulnerability. Thank you for this post. It’s almost like God put it in front of me to read. We are all human and sharing my story might just inspire someone else to open up and share theirs. I want to be able to say that I was true to myself. It’s not always easy to do when others place certain expectations on you, but being able to be yourself in spite of those expectations is the ultimate achievement. Thanks so much for your blogs. They are always inspirational. I also didn’t know there were other readers from Nigeria. I’ve been following your blog for about a year now and it’s truly inspiring. Much love from Nigeria. I love your blog and find them both timely and inspirational. My mom is on hospice and my son’s financee just gave birth to a beautiful little girl. We live together in the same house. Nature balances life at both ends. Your posts help us in-betweeners focus on living the best life we can while we can. Thank you. All excellent !! Yet it’s hard for me to say that love from another person is not an important aspect of human life. I have everything I want. I have lots and lots of self-love. But knowing that not a single person in this world wants to spend time with me – to be my partner on all these adventures – is pretty painful. Thank you thank you for such a wonderful article. I found myself both reminded of what I AM doing in my life that is worthwhile and loving…and what I am invited to “be with”. The be with one is guilt. Though I know I did my best as a young parent, I still struggle with the pain of regret. I am inspired, though, by your article to continue to forgive myself and look at my past through more loving lenses. Bless you both for all the beautiful things you write. I am a fan! Wow, very inspirational post! I love the information that you share here and will definitely be making sure that I can say all these things about my life. I am one of your super fans and blessed by your blog! I have a post idea. What if you asked readers to share what country they are from and to maybe tell a wee bit about themselves. Who is your typical reader–if such a person exists? What would they like to see you write about? I am a curious rural Kansas housewife with many interests. I always look forward to reading what you have to say. Thank you for not making me feel so alone. Very well written.. I am at the lowest that I’ve ever been and all of a sudden my questions are being answered and I will give myself permission to live my life the way I want. I am tired of beating myself up for all these years. Your insights make it seem very easy if we believe and I do! Thank you again from the bottom of my heart!! No parent should lose their child before them, my prayers are with Diane and her family. This post stirred so much in me today. Positive, love, self, warmth, owning a situation, healing, honest, etc. We all have something going on. Today was a great day for me. One day at a time. Many moons from now, while on my deathbed, I would say that I had a full life and a loving family. This is really a nice post. But the biggest problem with deciding to do something is deciding to wait to do it. Why put off doing something you really want to do? Anything worth doing is worth doing now. Am very inspired by your articles. It’s what i need during tough times. Thanks. I always enjoy reading your articles. They inspire me alot. Lately I’ve been going through emotional stress, but each time I go through your write ups I feel better. You have touched my life in many ways, and given me reasons to believe in myself and to move on. God bless you richly. I follow you on g+. I had somewhat related argument with my friend today. I had little argument with him today and said to him he is being just perfect example of what I don’t want to be. I said being a laid out, always perfect at studies is just not the way to be something. Later,I did ruminate over the fact that where is my life leading to? Am I taking all the decisions that just don’t make me regretful ? I love the idea of being vulnerable of who you are which contradict my beliefs from so many peers around . Some of your articles just hit me so hard that I love doing the crossover of my life again and again . ( We never know what we are here for , the mission is just to be happy, at least for me ) . Keep going guys. Cheers. Incredible. Very Inspirational. Thanks for this useful post. I pray I abide by this list. I always enjoy and often share these inspiring, enlivening posts. I love reading all your articles. You know that! Thanks a lot for your posts. They are helping me. OMG But # 5 did it for me…Thanks for that .. I love your posts and read them thoroughly, as well as the comments afterwards. I feel I am pretty good at being vulnerable … it seems to come naturally to me. Being vulnerable is like a flower opening up … it’s beautiful! Unfortunately, insecurity prevents some people from experiencing the joy of vulnerability. @Patti: Insecurity is something you can work on. You’ve got to stretch yourself slowly. Focus on your strengths. Spend time with supportive people. Celebrate your wins daily. Get more comfortable in your shoes by focusing on the present and doing what you do best. @Our international friends from Denmark, Nigeria and everywhere around the world: Thank you for greeting us and supporting our work. It’s truly an honor to have you as part of our small community. Thank you for sharing your insightful thoughts on life and suggestions of how to improve ours on a daily , or as I in times of crisis ( mine or others) say,” for an hour or just for the next minute”! Years of therapy and knowledge are presented in your articles for anyone to read and read again. To soak in and ponder and strive to apply at just the right time ! As I near the 60 (in human years), I am wiser with every one of life’s experiences . The tragic loss of my 7 year old Grandniece ,from leukemia , was the worst thing that had ever happened in my life. Watching that sweet, innocent, outdoor loving,horse riding, Nature-child, spend her last six months in a hospital room, changed the lives of all who knew her. I think the greatest losses provide us with the greatest of life’s lessons, IF we are open with our love enough to feel them. I am new to these articles and posts but they couldn’t have come to me at a better time in my life. They all seem to be speaking to a part of me. I look forward to every new article and the comments that follow. I can’t thank you enough. Please read with context in mind. You don’t have to please everyone to be someone..
@Patty, insecurity is our own way to protect ourselves. The older we are the more experiences we have allowed to enter into our lives, keep trying and failing, well, those failures brought to us a scar at some point, so be smart is what matters, what experience you know you will benefit or not. In internet era, what matters is what you truly know you have chosen (people, wisdom, spirit) to build and broad your perspectives, everything else, even good words applied to other people, don’t really matter. Awesome words! In perfect time! Since I’m going through some hardships nowadays .. I really need to hear such inspirational talk .. Number 3 hit home with me today. I want to be able to say that I dreamed big and went for it. I have been feeling so lost these past weeks and I really believe it’s because I haven’t been honest with myself among other things. I am committed to becoming the woman and artist I want to be and I will continue to take the steps needed to get there. 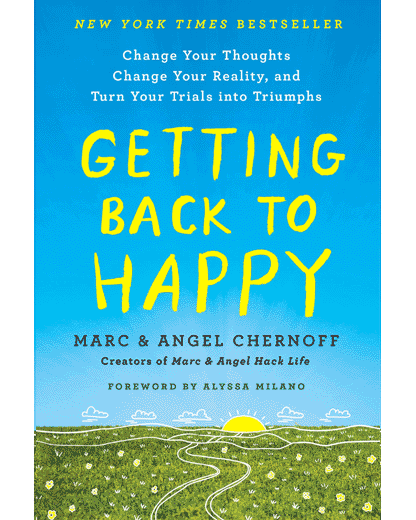 Thank you Marc and Angel with continually sharing these thoughts, ideas, and empowering tips with us. First visit to your site, but it looks incredible, and I am sure that we are quite in sync with our ideas on life, the universe, and perhaps….everything? This post really caught my eye, as the points you discuss are ones that myself, and perhaps most of the rest of the population of the world battle with, or at the very least, give little consideration to. I firmly believe that being open to new ideas is essential to see any sort of progress in one’s life, towards something better, more on purpose, and with greater happiness. Just the very concept of being open to new ‘possibilities’ and refusing to adhere to societal dogma about how you should be living your life is so important, and liberating too. One strategy that I really found useful, once I had got the ‘being TOTALLY honest with myself’ part sorted, was to look back over my life, think about what I loved doing as a kid, what I waste my time doing now, and not surprisingly, some links start to emerge. I’ve gone from being pretty lost, to doing exactly what I like to do, finding ways to remove the crap I hate, and I am now more productive (and happy) than I have been for years. I’ve written a number of bestselling books, I communicate with incredible authors from around the world, and I’m working towards helping others to become ‘unstuck’, and create in incredible life. It just takes some self-reflection, a heap of honesty, and a complete reluctance to do what you don’t enjoy. Life is very short, and has potential to end when you don’t expect it, so doing what others want and expect of you is lunacy. Anyway, thanks for a great post, really enjoyed it! Wow! Powerful stuff. I have been through the leukaemia thing myself. Luckily I was able to hang onto my life (for now!) but it made me realise how precious it was and I have certainly tried to do all the things you put in your blog. Love your life. You only get to do it once. Make sure that you live it the way YOU want and that you get everything you want from it. Most times that means putting everything you can into helping others, I’ve found. Someone else posted that they will say at the end “I had a wonderful, interesting life” or words to that effect. That’s my wish too. I hope that when my life is over, close family & friends will say that I cared about others (especially children and the elderly) and showed them and that I wanted things done right….wanted all people to be treated fairly. Well, this has been like one of the beautiful things I ever read. Thank you so much..
That I made a good living for my daughter’s life and that I enjoyed things that made me happy. I am new to your blog and so grateful to have added you to my reading list. I think it is vital to feed your brain and spirit truisms that help to keep you focused and moving in a healthy direction. as a recent cancer survivor, much of this article reiterates what I have learned on my journey to this point. Live NOW folks. Really….. Life is about much more than just paying bills then dying.